Let's cover the basics of what is stenciling...Then we'll move on to creating art! If you opened this page, I'm going to assume that you are a real novice of stenciling. If that’s not true then just scroll down until you find a topic that better suits you. So, what exactly are stencils? Think of a stencil as a series of holes cut into a sheet of resilient, waterproof material (like paper or plastic). When paint is applied through the cut out areas to the surface beneath, an image is formed. A stencil can be used to draw or paint identical shapes, letters, patterns or symbols. Open sections of the stencil are called islands. These are the areas that allow color to be applied on the surface under the stencil. 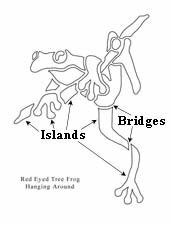 Bridges are the stencil material that separates the islands and keeps the shape of a stencil. These areas block color or paint from reaching the surface. So, now you know about stencils. But, what is stenciling? Stenciling is the creation of an image through the application of color on a stencil and through the removed sections (islands), leaving a reproduction of the image on the underlying surface. This can also be referred to as stencil painting. Stencils allow us to decorate with our own personal style even if we are not Leonardo da Vinci (or Picasso - if that’s more your style). If you find it difficult to sit down with paints and brushes and come away with a picture you're satisfied with, then stencils are for you. They eliminate problems with proportion (a fleur de lis will always be perfectly symmetrical), or perspective (objects will be consistent in depth or dimension and show whether they are near or far). 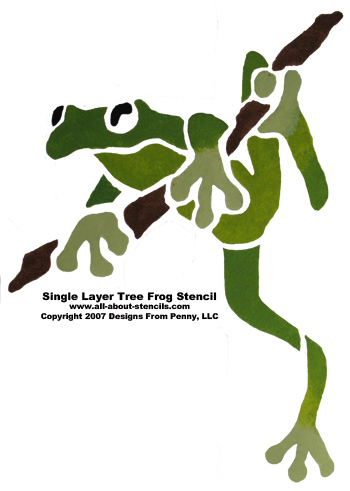 With stencils, you decide where you want an image and you pick the colors. You are the designer of your project. It’s just that you have a little help along the way. And don't worry - I won't tell anyone. The number and variety of pre-cut stencil designs and craft stencils available to you is mind numbing. However, if you can’t find one, than make your own. Oh come on now! Stencil making can be fun. Visit How To Make A Stencil for all the details. You should know that there are different types of stencils. I listed the most common here for you to become familiar with. I hope that this page has taught you all you need to know about what is stenciling! You are ready to move on to How to Stencil and creating some great works of art. Now that you've asked, "What is stenciling?" and got the scoop on this terrific arts and crafts hobby, we invite you to shop the catalog and browse a large variety of designs. So, check out our Stencils Catalog for your next (or first) project. Below is a sample of the design books that we offer. 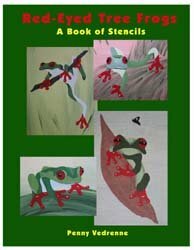 This book includes four frog stencils similar to the one used as an example on this page. Each book will come to you as a downloadable pdf file in your e-mail. Just check your e-mail after purchase for the link to connect to your file and print or save. It's that easy! 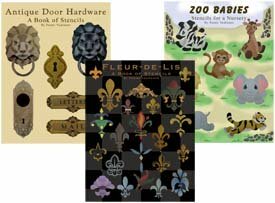 If you'd rather get your Stencil Pattern Books in Print (like these or the Frog Book above) then visit our Printer's Book Shop for a large variety of stencil collections. These books are easy to follow and come with complete instructions. You'll find all of the stencil designs used as examples throughout this site. Wait! Before you go here's a great video to get you started with a few basic stenciling tips. I hope you've learned all about what is stenciling? Enjoy! Return to Home Page from What is Stenciling?